Biodegradable - contains no harmful solvents such as carbon tetrachloride or trichlorethlene. Emulsifies Soils - Picks up greasy soils and holds them in suspension so they can easily be wiped or rinsed away. Leaves no film - Paintable surfaces cleaned with Citrus Supreme are ready for painting and polished surfaces have no streaks or spots. 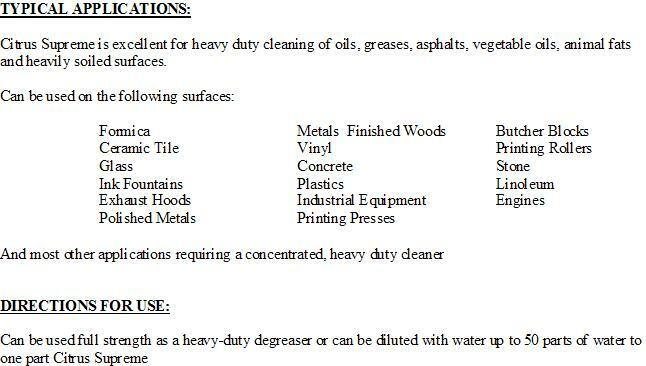 Strong degreasing action - Citrus Supreme’s fast emulsifying cleaning action penetrates grime for quick cleaning of iron, steel, aluminum surfaces, most plastics, rubber, concrete and glass surfaces. Economical - Highly concentrated; can be diluted with water up to 50 to 1. Citrus Supreme is excellent for heavy duty cleaning of oil, greass, asphalts, vegetable oils, animal fats and heavily soiled surfaces.